Aerts was due to be sold to English club Wolverhampton Wanderers, but he refused to take a drug test. Then his club FC Den Bosch transferred him on loan to GBA. After his loan-period in summer 2002, RBC Roosendaal signed the player on a 2-year contract. He moved in 2005 to Feyenoord. In January 2007, Aerts was on a loan move to Willem II because of minimal chances to play at Feyenoord. After a successful loan he has signed a permanent contract until 2010 at the Tilburg club. Although the Willem II results just prevented the club from relegation, German giants Hertha Berlin noticed the good play of the keeper and signed Aerts on a 2-year contract. Maikel Aerts will have another foreign experience, this time on a contract until 2012. In his first season, Aerts played most of the matches but in his second season, he had heavy competition as first choice. 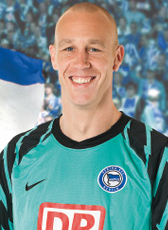 At the end of the 2011-12 season, Hertha offered him a new contract as stand-in goalie, but he refused the offer and he left the club looking for new opportunities. In summer 2012 he confirmed his retirement. His final competition match was against Augsburg in May 2011.